For years, Rudolph the Red-Nosed Reindeer has brightened the holidays! Celebrating the special place it holds the hearts of Christmas lovers, Jim Shore reimagines the film's most iconic scenes in his signature folk art style. Everyone's favorite reindeer's nose glows bright red in this handcrafted statue. Lighting the way with his shiny nose, Rudolph is ready for a foggy Christmas night. Beautifully designed in Jim Shore's folk art style, each piece is handcrafted in exquisite detail. A light up battery operated nose is activated with a switch on the base. 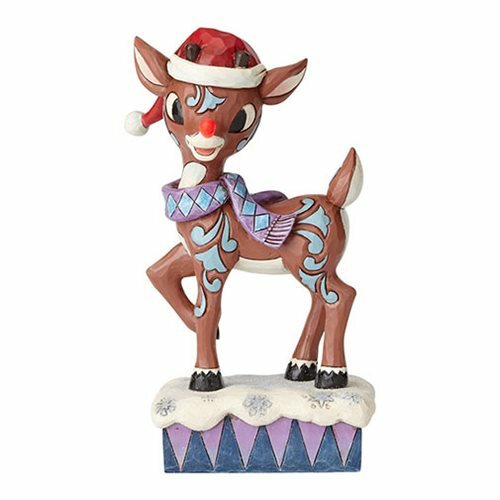 The Rudolph the Red-Nosed Reindeer Lighted Rudolph Wearing Hat Statue by Jim Shore measures about 6 1/2-inches tall x 3 7/8-inches long x 2 5/8-inches wide. Requires 3x "AG13" button cell batteries, included.